Mokuren Dojo: What to do about a stinky judo partner? ...over 1/3 of the guys I roll with stink so bad the smell is just about enough to make me tap. I don’t think they wash their gi's. If they do, it is probably so infrequent that the stank has already fortified itself against single washes. The stank alone is almost enough to make me quit. To me, it’s not considerate of your partners or respectful to your art or you dojo/gym. The disregard for others and apparent lack of respect for themselves bothers me. Boy, that's a problem that we've all grappled with, Dear Reader! Grappling partners so incredibly nasty that you are tempted to turn them into Homeland Defense for domestic terrorism using chemical weapons of mass destruction! And you're right... The stank does fortify itself after a while such that even if you do wash your gi, the stank goes stealth and hides until you put the gi back on and get hot and start to sweat again - then the heat-activated stank returns with a vengeance! First, Dear Reader, I recommend not rolling with those guys any more. Rolling around with someone who wears bacteria-laden rags to work out in is just not safe. We are all constantly getting minor (and sometime severe) gi burns and mat burns and smearing infectious sweaty pitstank into your abrasions doesn't seem that great an idea. Second, tell them. They might not even know because stank that bad kills brain cells. Be direct. Say something like, "Dude, you stink. You are so repulsive that you make me want to puke. I will not roll around in your disgusting crotch with you smelling like that." Perhaps they will get the message if it is that forthright. Third, If someone tells you that your gi has been invaded by the stank, don't get defensive. It happens to the best of us every so often. Here's what you should do... Wash... Your...Uniform!!! In vinegar. 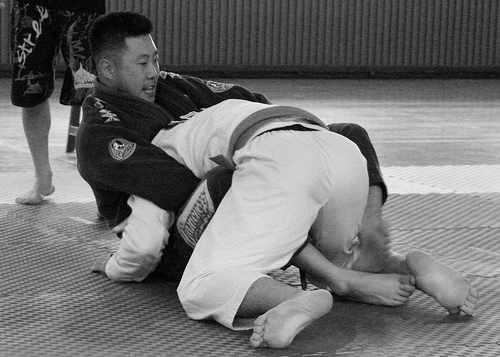 Throw your gi in the wash with some washing soap and a cup of vinegar. The acid will kill the growies that are infesting the cloth of your pits. And a touch of DO for the BO before class won't hurt either. Your grappling partners will thank you and you'll thank me. The worst incident I had with BO was when one of the students whom I was teaching shomen ate, had the most foul smelling hands you can imagine. I think it penetrated my sinuses because I tried to wash it off of my face, but it seemed to linger for days. I didn't say anything to him then, but I mentioned it a long time later, and he said he might've been involved with an activity with his girlfriend just before coming to class. After that day, I brought handy wipes to practice for a while. If that happens to you, tell them to leave practice and wash their hands.